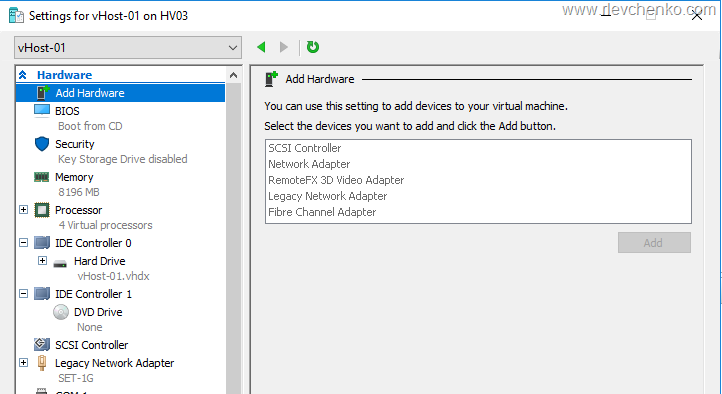 I’ve been doing recently VMware ESXi deployment in my lab environment and would like to share main steps required to make it work on nested Hyper-V. Needless to say, nested virtualization works great only for demo and labs, therefore, running ESXi under Hyper-V is a completely unsupported in production environments. 1. Download VMWare ESXi offline bundle available at product download page (e.g. ESXi6.0). You can also download a ESXi image customized by vendor. For example, here is a direct download link for Dell’s ESXi 6.0 image which includes Dell’s VIBs in addition to built-in installation bundles provided by VMware. 3. Copy the downloaded files to the same folder (e.g. ‘D:\Images\VMware ESXi 6\’). It’ll be used as a work folder. 10. 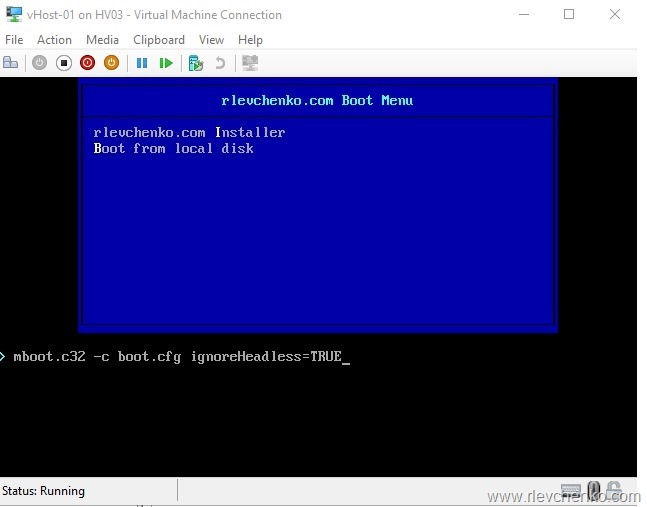 Turn on the VM, attach the created ESXi ISO and press TAB on the boot screen, then type ignoreHeadless=TRUE and press Enter. Otherwise, ESXi boot will hang while booting (I assume it’s all because ESXi is running on non-HCL hardware. VM is a bit out of the HCL list..). Once ESXi is successfully started, define settings for management network, enable a Shell, and then press Alt+F1 to enter to a console. We need to set a VMKernel boot-time parameter. Otherwise, you will always need to enable ignoreHeadless after every reboot. Close the console by pressing ALT+F2, reboot ESXi and verify that it starts up seamlessly. That’s it. Now you have a ESXi host running on a Hyper-V VM. In the previous post we discussed the tool that makes upgrading and updating process easier – vSphere Update Manager. Now we are going to talk over manual process of updating core vSphere’s components – ESXi and vCenter. This type of updating is recommended when you have a small-sized infrastructure (whether it’s demo or production). Today’s FAQ does not cover complex architecture (with external SSO or etc.) and upgrading itself . To get some more information please use links in the references. What’s the right update sequence for ESXi and vCenter ? vCenter is always first, updating ESXi hosts are the second step. Additionally you need to check VMware Tools (3rd step) and VM Hardware Version (4th step) and upgrade them if applicable. How to update vCenter Appliance? How to update Windows-based vCenter? During the patch process, the Management Software undergoes a downtime as the patch restarts the services. So, be ready for vCenter unavailability for a short time. 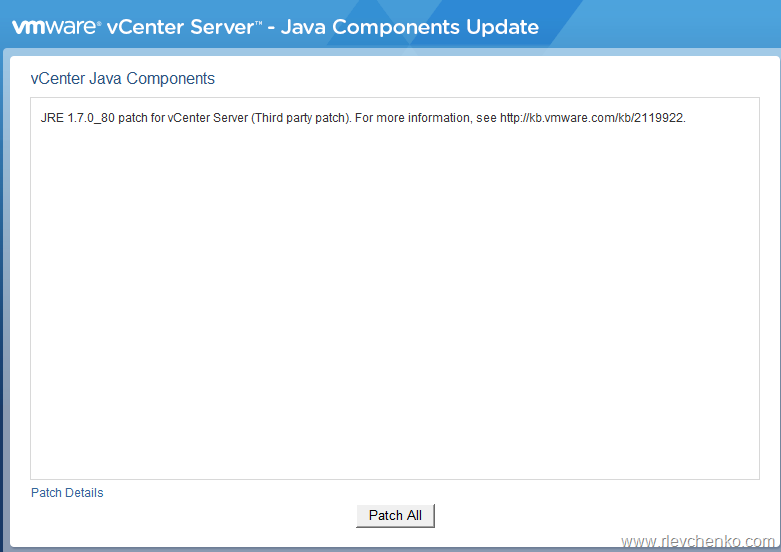 How to update vCenter Appliance from the web client? With the release vCenter Server Appliance 6.0 update 1b, you able to update vCenter Appliance from the web-based management interface (VAMI). 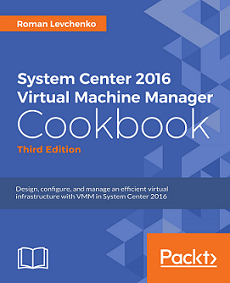 Open https://vcenterfqdn:5480, go to Update section and check for updates. If your hosts are not up to date, click on “Install updates”. How to update ESXi hosts? How to upgrade VMware tools and VM hardware?